Before we go into details, here is the definition who can be called Ultra Wealthy – The individuals who have their net worth higher than USD 30 million (roughly 180 crore rupees) can be termed as Ultra wealthy or Ultra High Net Worth (UHNW) Individuals. According to the 2013 Wealth-X report, India has 7850 UHNW individuals in 2013 compared to 7730 in 2012 an increased of 1.6 percent. Out of these, 103 individuals have wealth of over USD 1 Billion dollars. The billionaire club has shrunk from 109 people in 2012 to 103 in 2013. 2 How India has performed as compared to it’s peers? 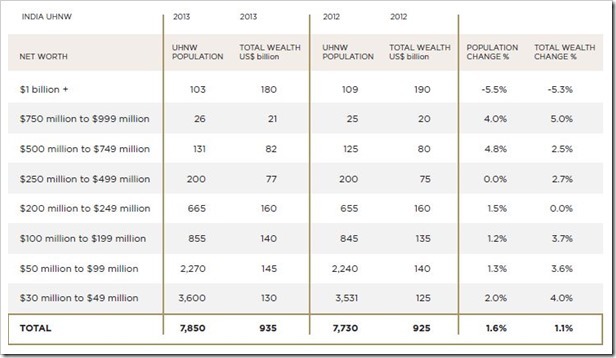 3 Where Does Ultra Wealthy population Reside in India? How India has performed as compared to it’s peers? As far as developing countries go, India has managed to increase its ultra wealthy head-count. Though China has much higher UHNW population (10,675), it has shrunk by over 5 percent as compared to 2012 when they had 11,245 ultra wealthy individuals. Other developing countries like Brazil also showed contraction in numbers as compared to last year. 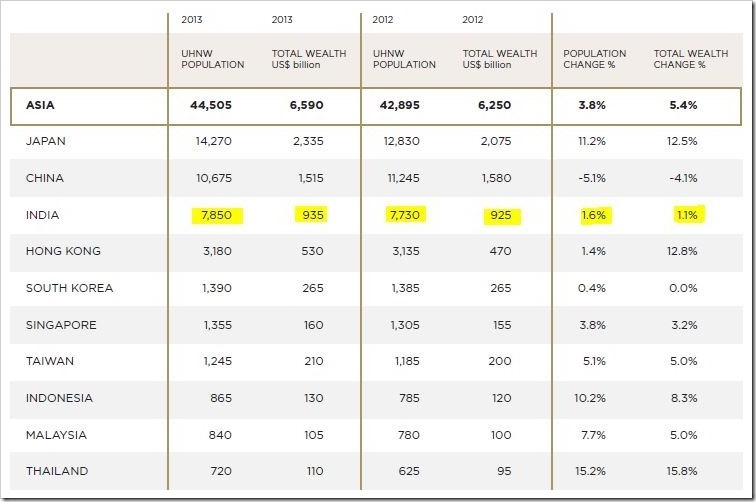 Where Does Ultra Wealthy population Reside in India? As can be expected, the Ultra rich Indians reside in larger cities with Mumbai and Delhi accounting for more than 50 percent of the country’s UHNW population. 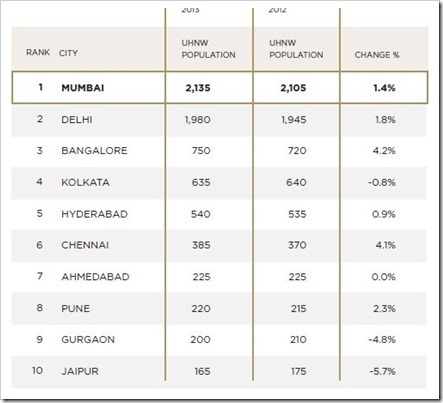 More than 90 percent of India’s UHNW population live in these top 10 cities. One interesting aspect about India’s super rich club is that it has highest percentage of females compared to any other country in the world. At 16 percent, India has the highest UHNW female proportion. India has over 1,250 UHNW women with a combined fortune of US$95 billion. The global average is 12 percent. 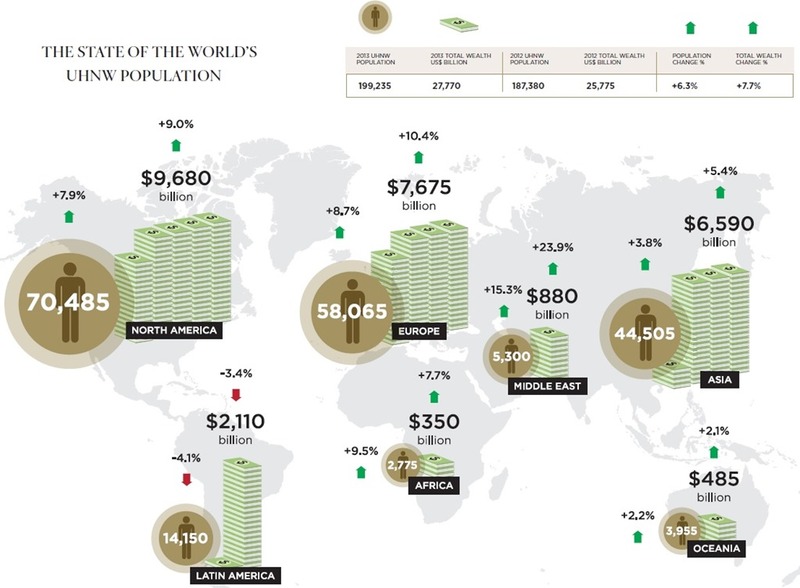 The total wealth of the world’s super rich is equivalent to 40 percent of the world’s GDP despite UHNW individuals accounting for approximately 1 in every 35,000 people. UHNW wealth has increased by just under USD 2 trillion in the past 12 months, greater than the GDP of India. 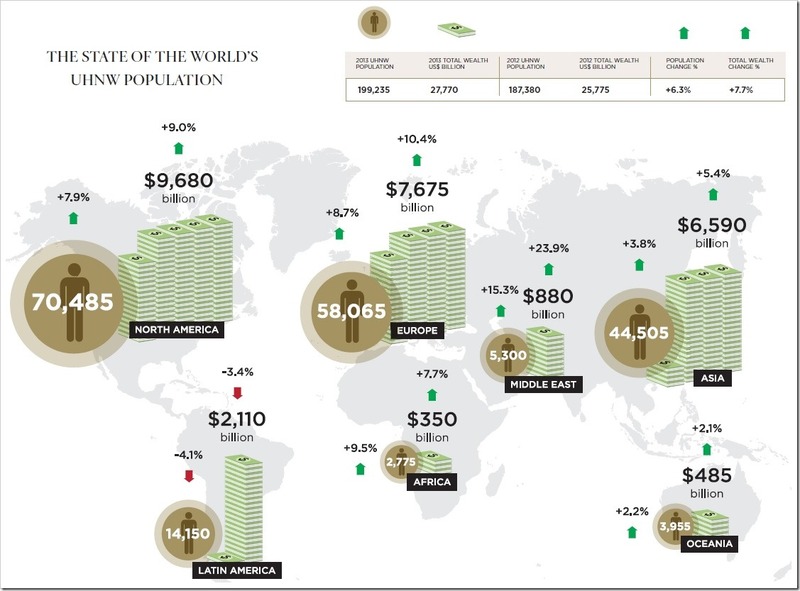 Average wealth of an UHNW individual has risen to US$139.4 million, up US$1.8 million from last year. North America and Europe bounced back in the past 12 months. Strong equity markets have buoyed UHNW wealth despite high unemployment and slow GDP growth in Europe. Only the Middle East increased its wealth faster than North America and Europe. Latin America was the only region to suffer a decline, with both its UHNW population and total wealth falling, by 600 individuals and US$75 billion respectively. Asian growth has lagged behind that of Europe and North America in the past 12 months. However, Wealth-X continues to expect the long-term shift of wealth to Asia. "India Now Has 7850 Ultra Wealthy Individuals With Highest Female Population In The World: Report", 5 out of 5 based on 1 ratings. Wonderful ! Thanks for this insights !